See also original Thawte 123 plan location on their website! A simple way to quickly enable encrypted connections to your web server. Fastest issuance time (3 days or less). 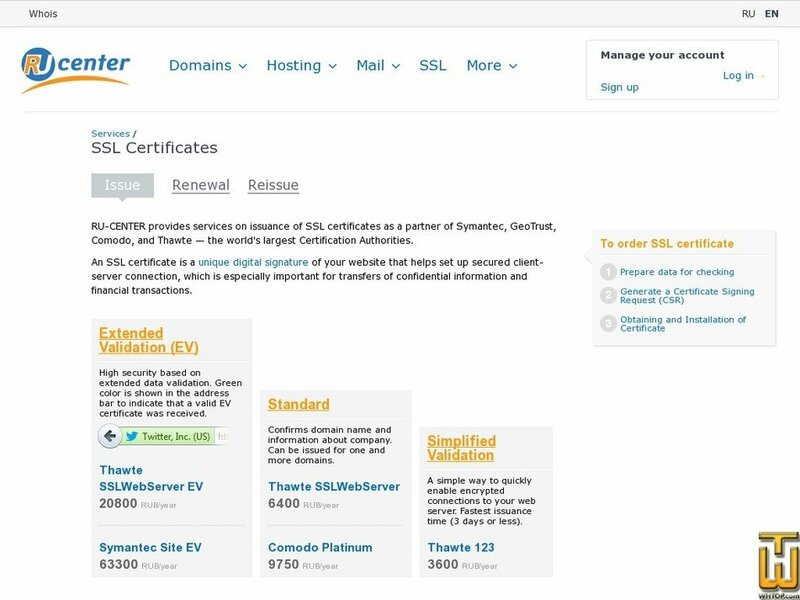 RU-CENTER provides services on issuance of SSL certificates as a partner of Symantec, GeoTrust, Comodo, and Thawte — the world's largest Certification Authorities. An SSL certificate is a unique digital signature of your website that helps set up secured client-server connection, which is especially important for transfers of confidential information and financial transactions. Protect your website quickly and at a very low price. The lowest cost SSL certificate available. This is the cheapest SSL certificate, with a "green line".